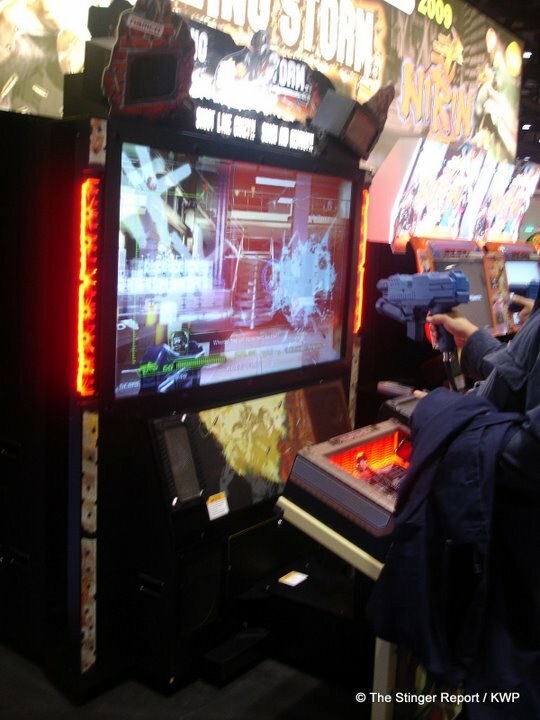 As I mentioned yesterday, the upcoming Amusement Expo is certainly turning out to be the place where light-gun game fans have a lot to look forward to as nearly every company which produces coin-op video will have something to show off that uses a light-gun in one form or another. Of those game makers, Sega is setting it’s sights on the competition as yesterday they issued a press release which took a shot at Deadstorm Pirates in the title and today, they have issued one regarding Rambo that takes a shot at Terminator. 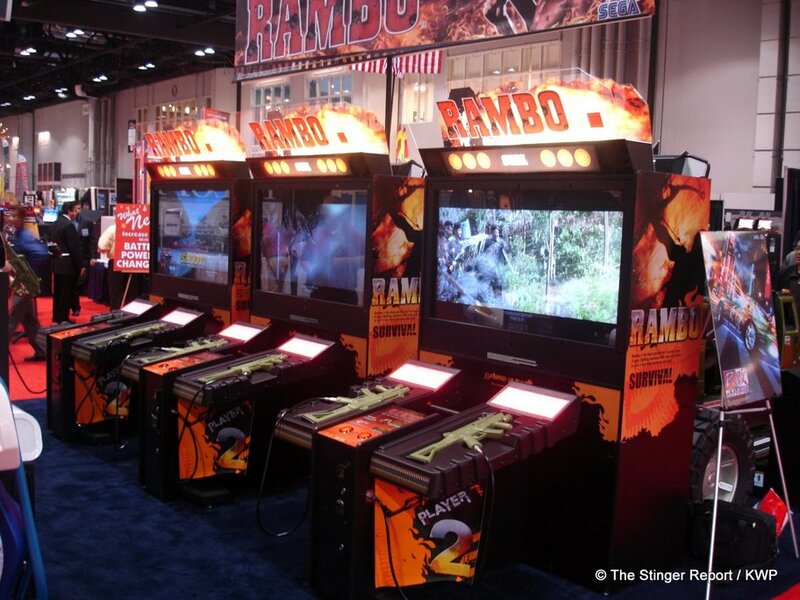 As we had mentioned previously, Sega has announced a new version of the Rambo cabinet that fits in between the standard 32″ version and the larger 50″ deluxe they had originally released with a new 42″ LCD cabinet (which just so happens to look a little bit like the Terminator Salvation cabinet). There is no indication as to whether or not the software has been updated for this new version or not and it looks like it’s just a cabinet upgrade that is set to compete price wise with Terminator (the press release headline mentions it’s at an unbeatable price but the release does not say what that is). You can see the press release here and the PDF sporting the new cabinet here. UPDATE: I was looking around distributor sites and at least one distributor, BMI Gaming is listing the 42″ game as in stock, for sale at $8275, which is a few hundred under their listing for Terminator. That puts the game around the price the 32″ version was selling for when it was new. I don’t see it listed yet on the other distributor sites I check but that price point won’t fluctuate too much. I do wonder how this will push the price of the 32″ down, but that is something we will have to wait and see on. As we soon approach the Amusement Expo next week in Vegas, we are starting to hear about the games we will be seeing there and today Sega unveiled the games that they will feature at the show in a press release.I have to say that it looks like Amusement Expo is shaping up to be a great show and I’m looking forward to getting some hands-on time with all of the new offerings. 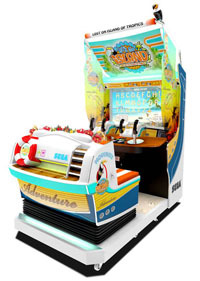 First off, they will be showing off a Let’s Go Island cabinet for the first time. The cabinet will be shown in only one configuration with the motion base and a 42″ screen. As you can see in the picture, the cabinet is quite different from Let’s Go Island, it’s like a cross between Tetris Giant and Hummer. Speaking of Hummer (which was released in the standard version last month), they will have a new version of the game to show off there called the “Mini-deluxe” (not unlike GlobalVR’s new mini-deluxe design on Twisted). The mini-deluxe configuration still features two seats but the footprint is smaller than the full deluxe. That should also mean that the price tag will be smaller too, leading to more sales. 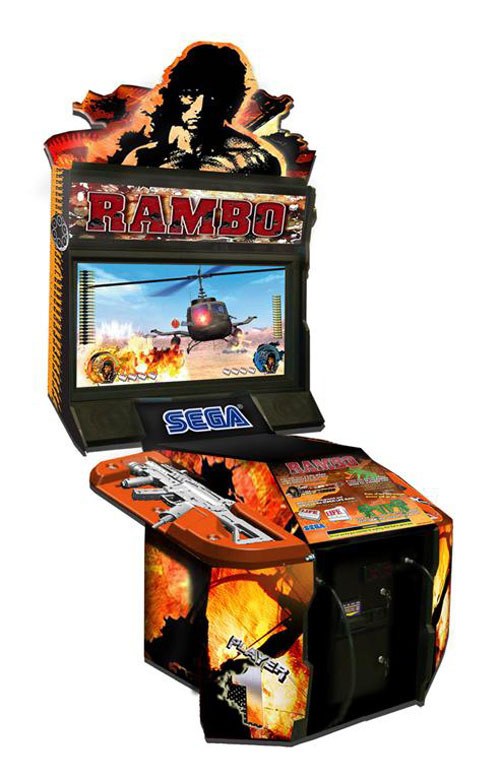 In a surprise Sega also has revealed a new configuration of Rambo, with the game coming in a new mid-range cabinet with a 42″ LCD, putting the game in the realm of some other 42″ shooters we’re seeing pop-up out there. 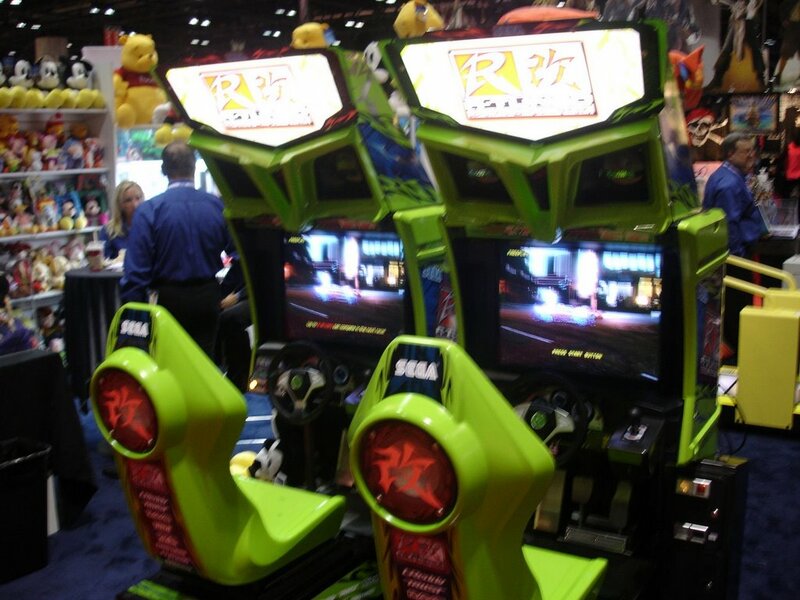 Sega Racing Classic, which will be released this month will also be at the show and we’ll have to see if the software is different from what was shown at IAAPA. Beyond that the line-up includes games we have already seen or new video redemption items, all of which we’ll get a glimpse at next week. I will be attending the show and capturing video once again (this time with my HD camera that has a much better microphone than what I had to settle with last time), so stay tuned for Arcade Heroes for a look at these and many other games! 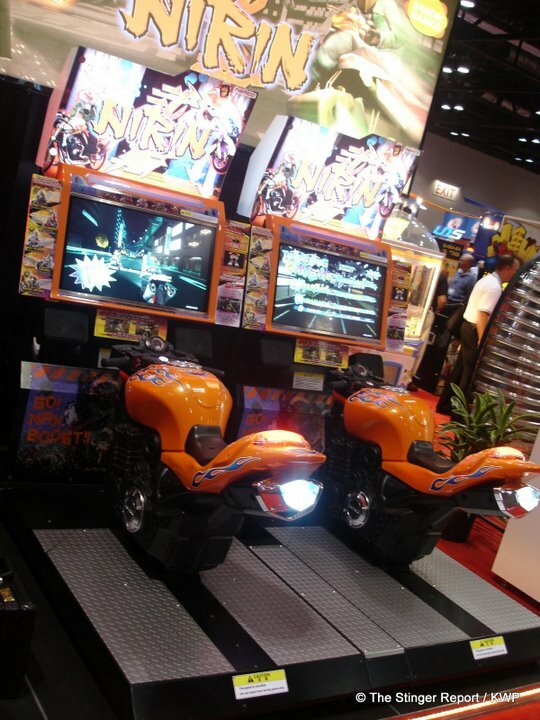 Next up from the IAAPA floor today, Sega and Namco. As always, click on the thumbnails for a full view, thanks to Kevin Williams of The Stinger Report for sending us these pics. 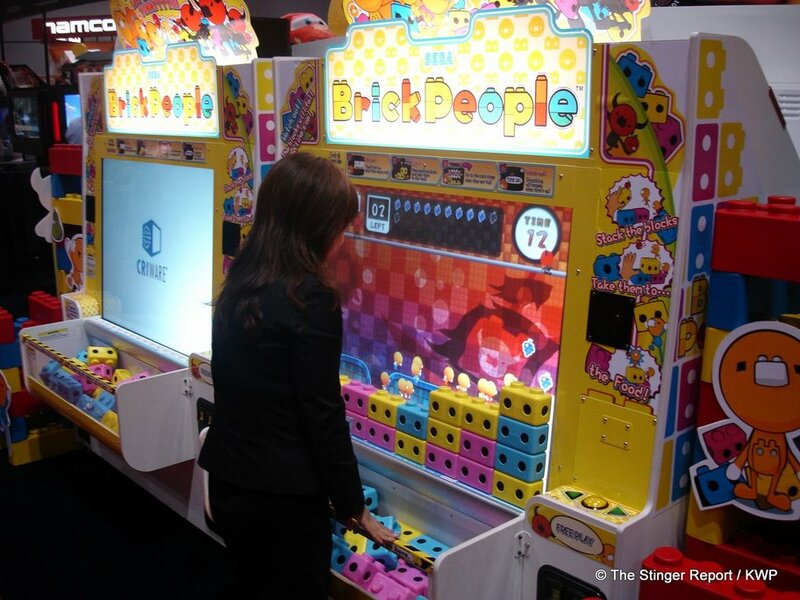 One big surprise from Sega is the game Brick People, which we first showed you a few weeks ago where it was testing in Japan. I didn’t expect to see this one brought over to the US so it’s a pleasant surprise. 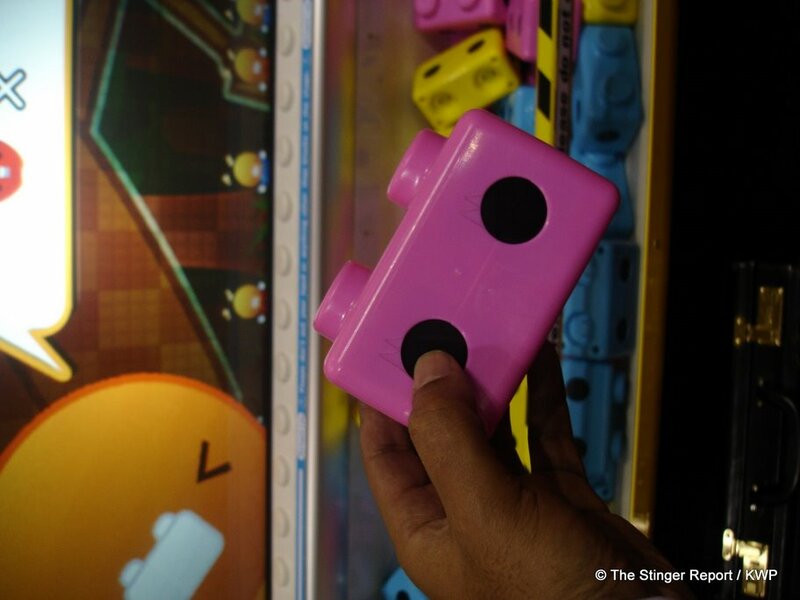 The object of the game is to get the brick people to the food by placing the bricks down in front of the screen, which they then climb up on. It does have enemies which try to block your path but I’m not sure how you get rid of them, it will be interesting to see this one in action. Next up, Hummer Extreme. 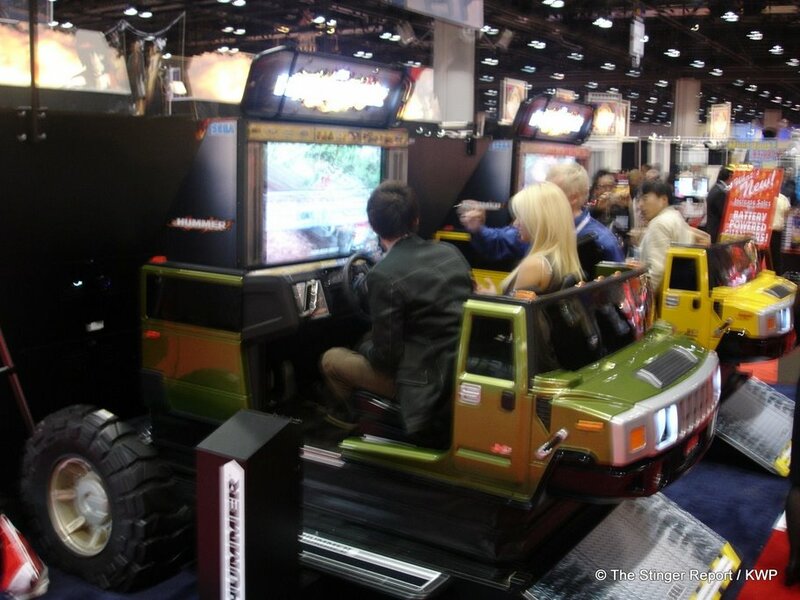 Hummer has a motion base and uses a setup similar to Outrun2 Super Deluxe where two people can play with the game switching between the two as they navigate an obstacle course. Below: Sega Rally 3 and Harley Davidson. We had figured that HD would make it to the States when it was shown in Japan recently although there hadn’t been any official confirmation of that until now. 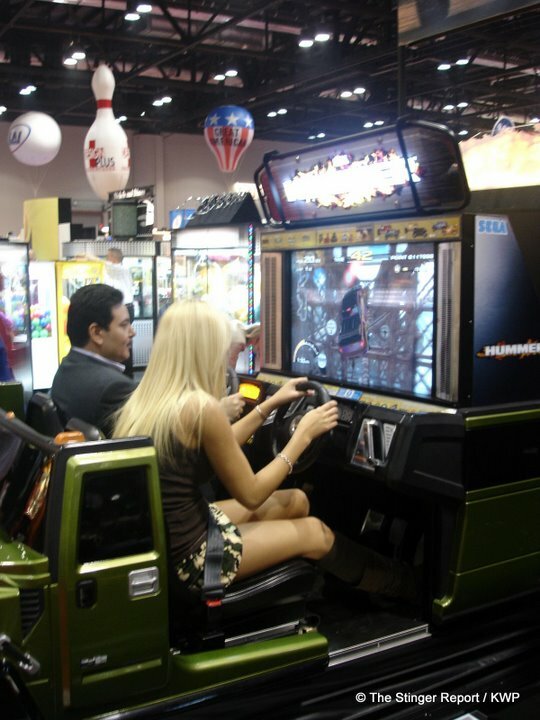 As you can see below, there are two deluxe cabs of the game there, not sure if a standard cabinet was shown and they also changed the SR3 cabinet from AMOA (which they had told me would happen). It looks like the screens are bigger in this cab then they were at AMOA. Also several deluxe Rambo models were at the show. 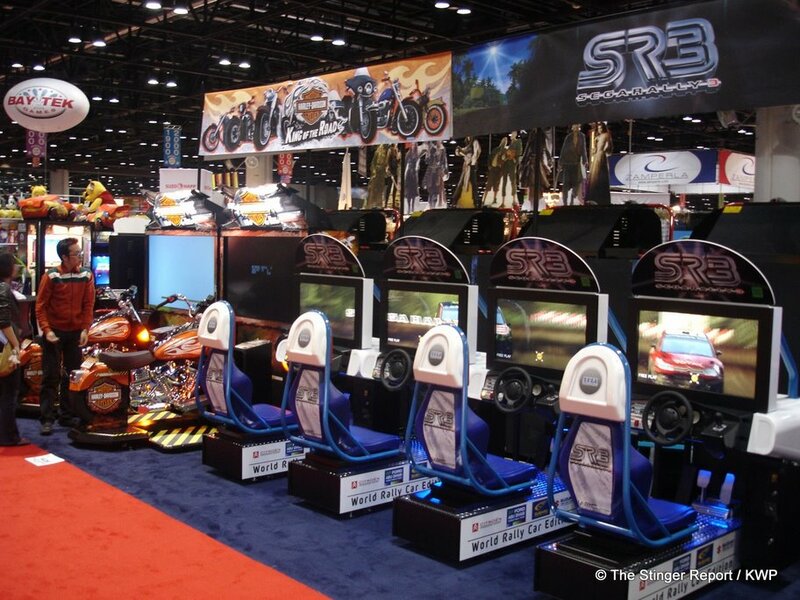 Finally for Sega today, R-Tuned Street Racing was there, no word yet on how it plays but it rounds out Sega’s diverse line-up of racing games overall. Now onto Namco. I had hoped that they would be showing some new product and they have. It’s now confirmed that both Razing Storm and Nirin will be available in the US. No word on how soon though, just sometime in 2009. 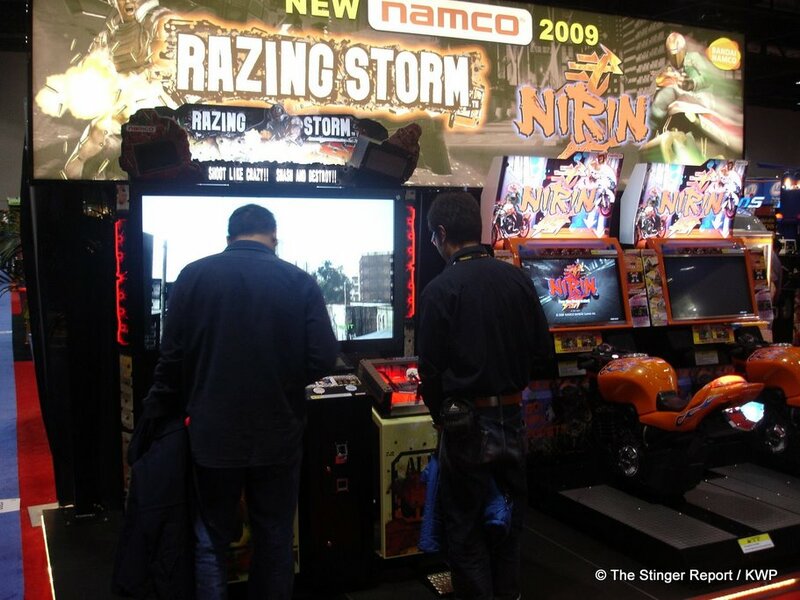 We’ve covered a little bit about both games previously, Razing Storm is a sort of spiritual successor to Crisis Zone, Nirin is a street racing motorcycle game.